Patrick was last month warned against increasing rail charges at Port Botany, according to the NSW Government, which has defended its decision to regulate pricing. Ports and Waterways Minister Eric Roozendaal has fended off Opposition criticism over a decision to stop Patrick from increasing rail fees from $15 to $25 per container. Roozendaal this week intervened in the running of the port by ruling that rail freight charges will be regulated by government. He says a rail infrastructure taskforce that involved industry was working to resolve rail issues at the port, but Patrick stepped outside the process by trying to lift charges. "In August Sydney Ports Corporation warned Patrick stevedoring not to go down that path, but it stepped outside the process," Roozendaal says. He claims the charges would have made rail uneconomical and pushed more trucks onto Sydney’s road network. "The community will not stand for it and this government will not stand for it," Roozendaal says. "The communities of Sydney and NSW do not want more freight forced onto our roads." Despite suggestions Roozendaal did not consult Patrick before making his decision, he says he "had long discussions" with the stevedore, rail operators and the Sydney Ports Corporation. 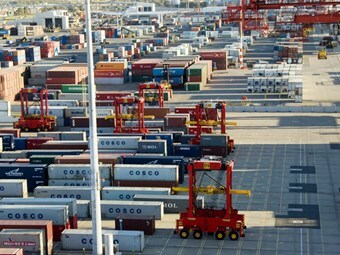 Patrick Container Ports General Manager Paul Garaty says the stevedore tried to lift prices to recover its costs and improve rail operations. He says less than one in ten trains arrive at the port on time, while more than one in five do not turn up at all. Liberal MLC Matthew Mason-Cox has questioned what non-pricing initiatives the Government has taken to improve rail efficiency at the port and whether it is aware of the percentage of trains that do not arrive on time. Reiterating the Government’s pledge to have 40 percent of freight carried on rail, Roozendaal says the Government is investing in intermodal facilities at Enfield, Moorebank and Minto. "There has been an increase in the volume of containers being transported on rail to a total of 370,000 tonnes a year," he says. According to Garaty, Patrick stands to lose $3 million annually from Roozendaal’s decision to regulate pricing. "We have proposed increased fees and new rules to provide incentives to make rail more efficient. But even with the proposed increase, Patrick will still not cover the costs of servicing rail at Port Botany," Garaty says. "As a commercial entity, Patrick simply cannot continue to subsidise this inefficient and inconsistent rail performance at its Port Botany." According to Patrick, it stands to lose about $3 million a year due to the Government’s decision to regulate pricing. Garaty says Patrick wants to work with government to ensure more freight is carried on rail. However, he says the best way to do this is through greater cooperation and market-based solutions. Patrick introduced the rail fee in 2002 and increased it from $10 to $15 in 2008. The NSW branch of the Australian Trucking Association supports the Government’s decision and says a price rise will reduce rail’s efficiency and lead to cost increases for consumer goods.